We decided to reduce all the chemicals and toxins from Jacob's life... and from the family... So again we researched and bought Halos and Horns bath and shower gel which is totally chemical free. 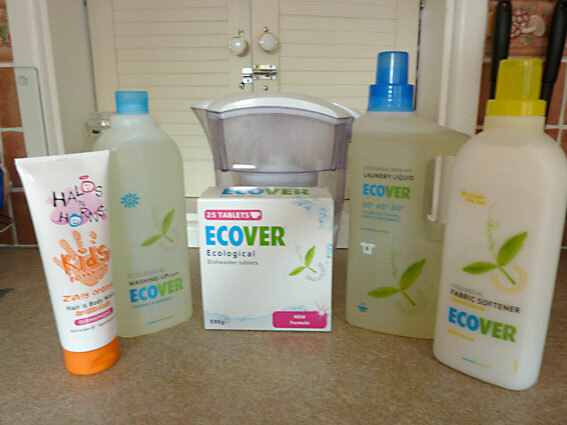 We bought Ecover products for the house to limit all the harmful chemicals in products, so we use Ecover non-bio, fabric softener, washing-up liquid etc etc. The reason being was that if we were taking the toxins/chemicals out of food and still using the normal bath/shower gel etc, we are counteracting the good we are putting into Jacob's body. We also got a water filter to reduce chemicals in the water. Basically to limit all chemicals and toxins as much as we are physically able to. All these products can be bought at most supermarkets... I definitely know Tesco do both as that's where we get ours from.